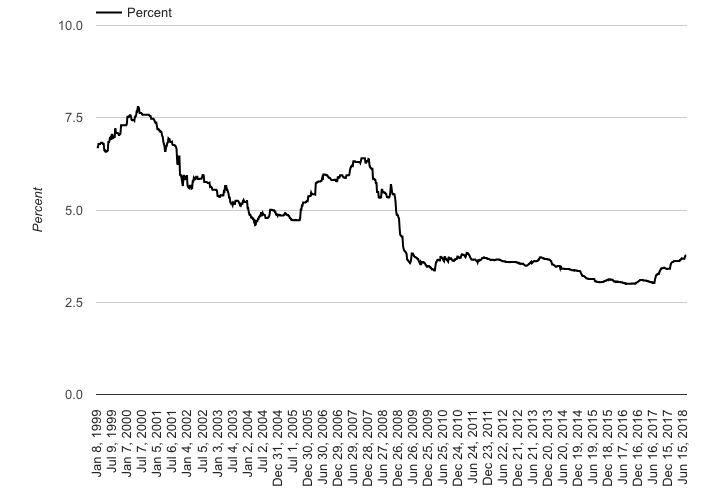 After Years of plunging interest rates, Canadian households now face the unthinkable, higher borrowing costs. Recent data from the Bank of Canada, and compiled by Better Dwelling, shows the effective weekly borrowing rate at a seven-year high. The effective borrowing rate is the interest rate which the typical household would get if they went to the bank for a loan. The weekly effective borrowing rate reached 3.77% at the end of July, a jump of 18.55% from last year. This was the highest level Canadians have experienced since May 2011. As borrowing costs ratchet higher, and lending standards become more stringent, mortgage growth continue slow. Recent mortgage data shows the him slowest pace of growth since 2001. Unsurprisingly this has weighed on national home sales, which through the first six months of 2018 have declined by 14.6% year-over-year. 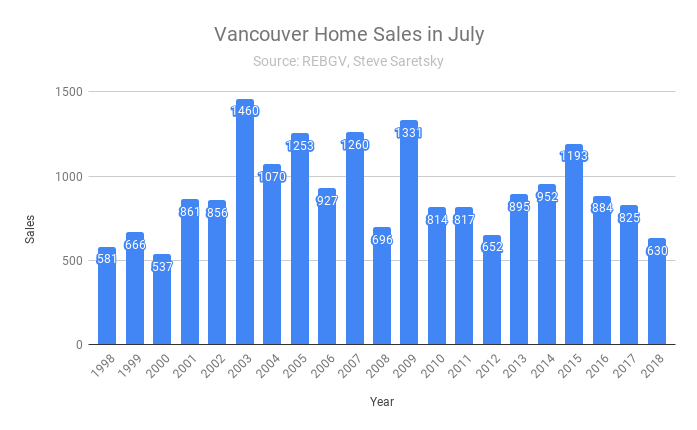 The slow down is particularly acute in Vancouver where home sales for the month of July slowed to an 18 year low, virtually in line with the pace of mortgage growth. Vancouver home sales in July across all property types. While CMHC has recently announced it will create more favourable lending conditions for self-employed individuals, it is ironically reviewing ways to curb mortgage fraud which is arguably more prevalent from self employed individuals. In 2017, data from Equifax Canada indicated that suspected fraud increased by 52% since 2013. Although this really shouldn’t come as a surprise as home values have grossly outpaced wage inflation, which has threatened the basic human need of shelter. As a result of the CMHC requests, the CRA says it is now exploring ways to improve how it delivers taxpayer-specific information in a secure manner, including securely sharing tax information with financial institutions contingent on client consent.